Boone Jenner (CBJ - 38) is named first star. He had one goal and two assists in the game. A Blue Jackets win means a hug between Sergei Bobrovsky (72) and Nick Foligno (71). 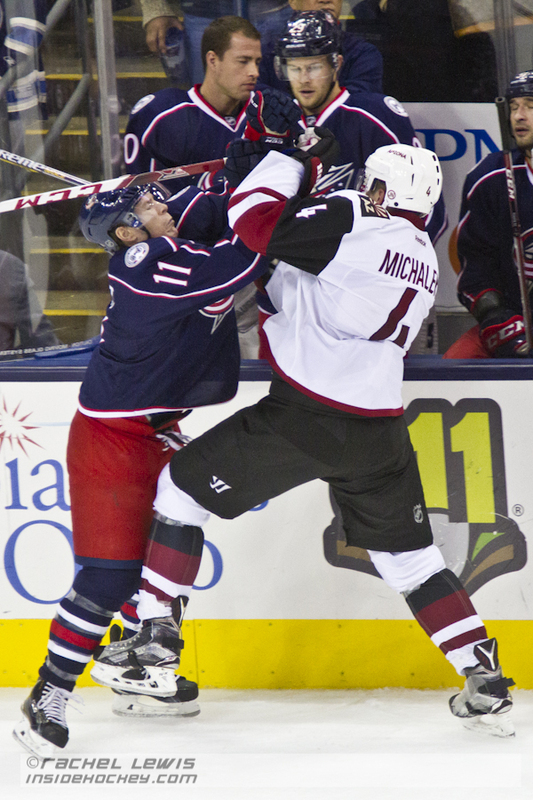 Matt Calvert (CBJ - 11) tangles with Zbynek Michalek (ARI - 4). 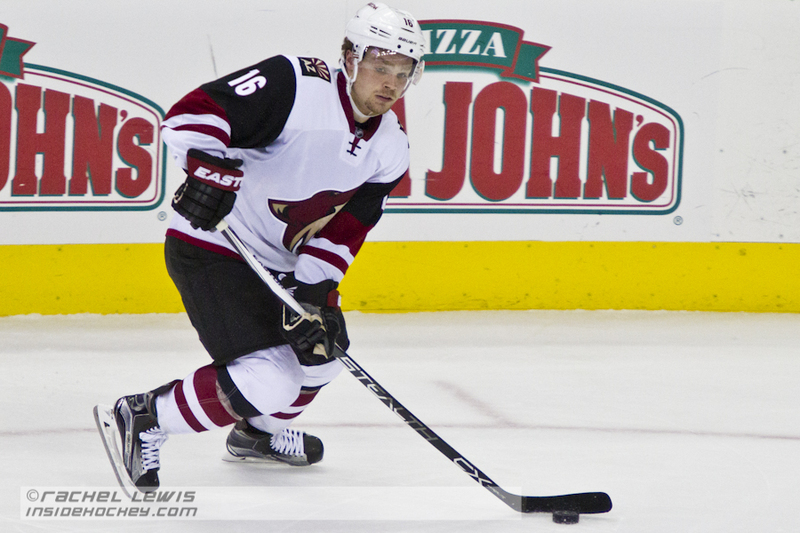 Max Domi (ARI - 16) skates the puck. William Karlsson (CBJ - 25) celebrates his second goal of the game with teammates. William Karlsson (CBJ - 25) scored 2 of the Blue Jackets' 5 goals. Martin Hanzal (ARI - 11) skates the puck away from Rene Bourque (CBJ - 18). Cam Atkinson (CBJ - 13) finished the game with an assist. Max Domi (ARI - 16) takes on Jared Boll (CBJ - 40). Brandon Saad (CBJ - 20) scored 1 of the Blue Jackets' 5 goals. Fedor Tyutin (CBJ - 51) keeps Brad Richardson (ARI - 12) from the puck. Ryan Murray (CBJ - 27) skates the puck out of the Blue Jackets zone. 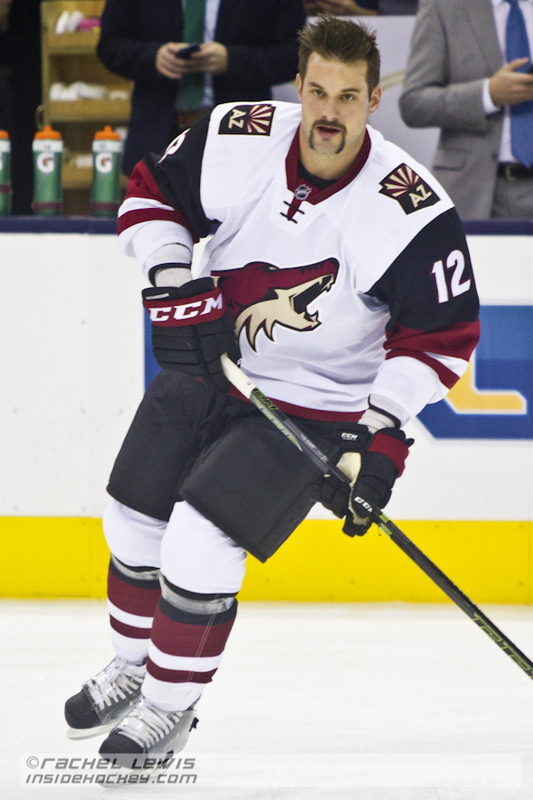 Zbynek Michalek (ARI - 4) sports a Movember mustache. Anthony Duclair (ARI - 10) scores a goal against Sergei Bobrovsky (CBJ - 72). Anthony Duclair (ARI - 10) knocks Cam Atkinson (CBJ - 13) off the puck. Max Domi (ARI - 16) is the son of former NHLer Tie Domi. Connor Murphy (ARI - 5) is a Columbus area native. Antoine Vermette (ARI - 50) sporting a mustache for Movember. Brad Richardson (ARI- 12) sporting a mustache for Movember. 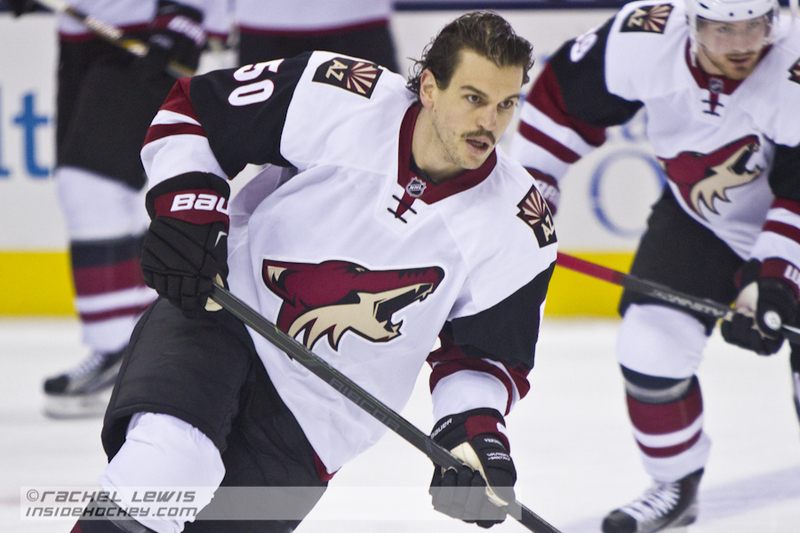 Antoine Vermette (ARI – 50) sporting a mustache for Movember. 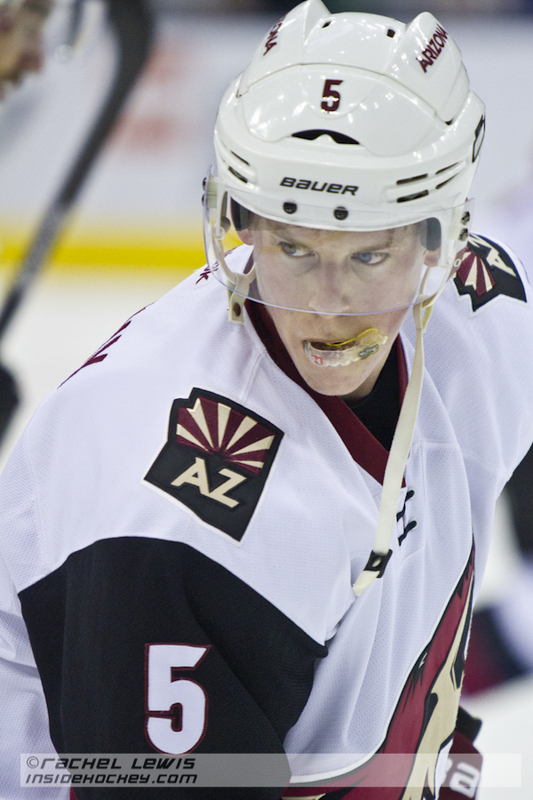 Connor Murphy (ARI – 5) is a Columbus area native. Max Domi (ARI – 16) is the son of former NHLer Tie Domi. 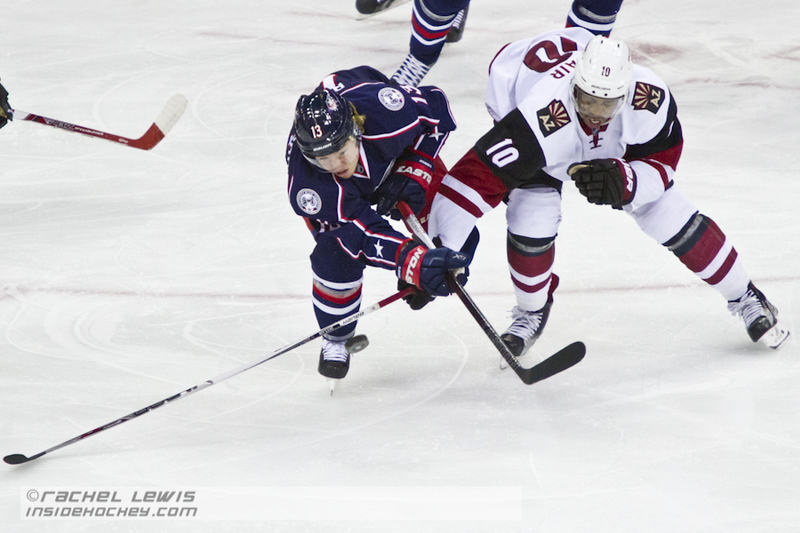 Anthony Duclair (ARI – 10) knocks Cam Atkinson (CBJ – 13) off the puck. Anthony Duclair (ARI – 10) scores a goal against Sergei Bobrovsky (CBJ – 72). 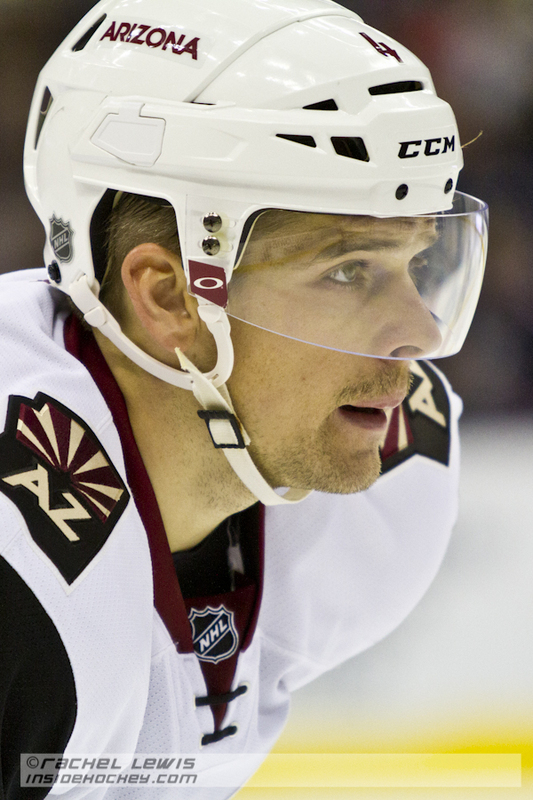 Zbynek Michalek (ARI – 4) sports a Movember mustache. 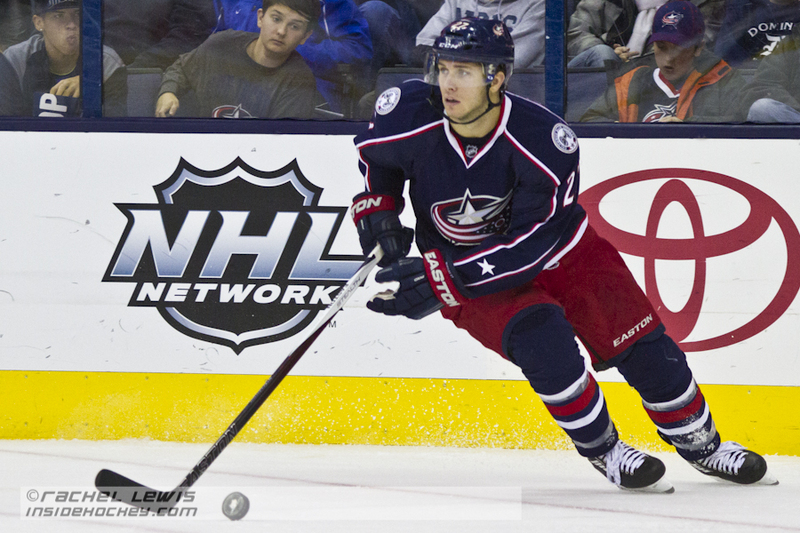 Ryan Murray (CBJ – 27) skates the puck out of the Blue Jackets zone. Fedor Tyutin (CBJ – 51) keeps Brad Richardson (ARI – 12) from the puck. 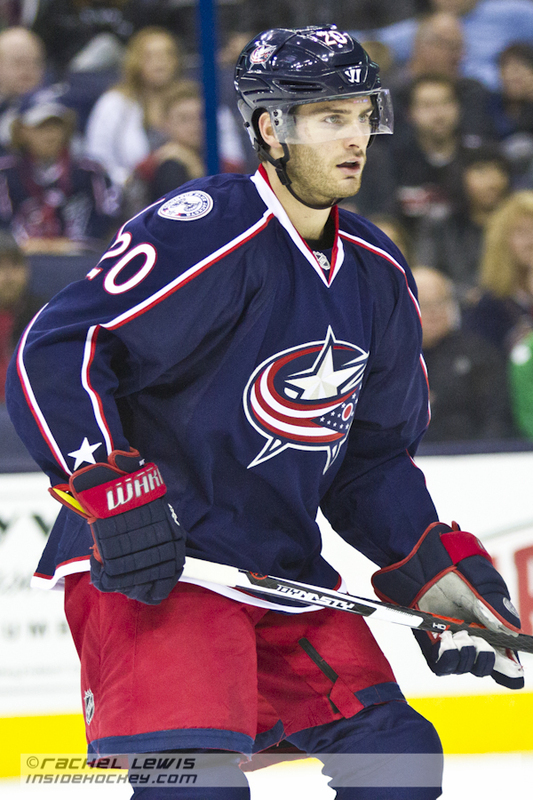 Brandon Saad (CBJ – 20) scored 1 of the Blue Jackets’ 5 goals. 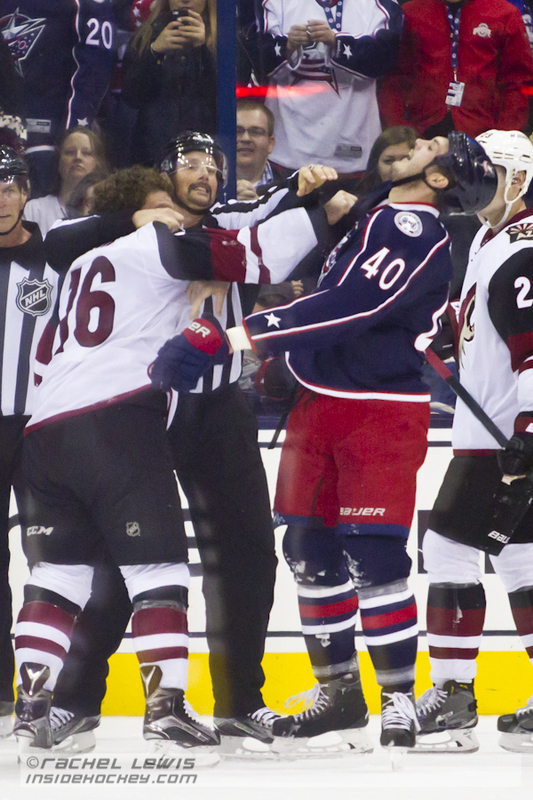 Max Domi (ARI – 16) takes on Jared Boll (CBJ – 40). Cam Atkinson (CBJ – 13) finished the game with an assist. Martin Hanzal (ARI – 11) skates the puck away from Rene Bourque (CBJ – 18). 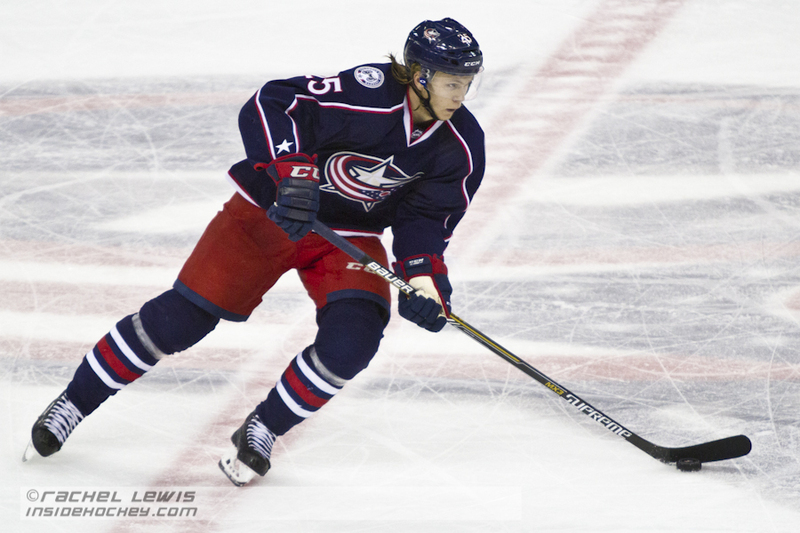 William Karlsson (CBJ – 25) scored 2 of the Blue Jackets’ 5 goals. William Karlsson (CBJ – 25) celebrates his second goal of the game with teammates. 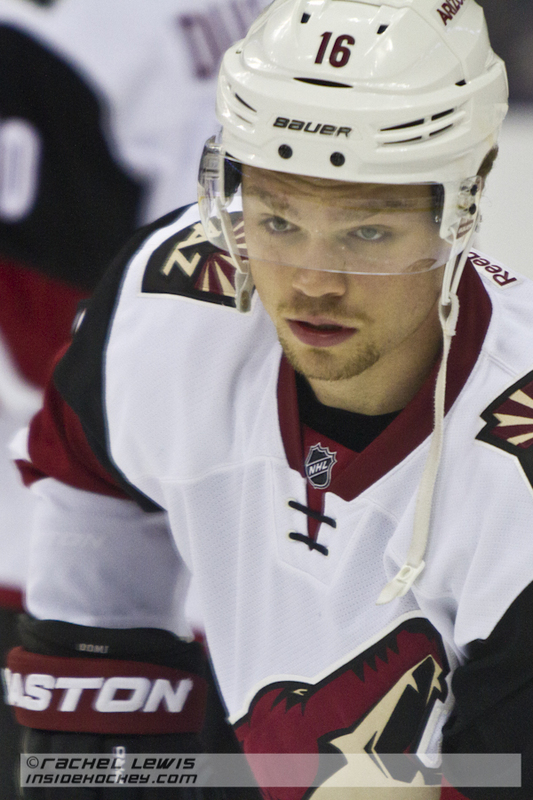 Max Domi (ARI – 16) skates the puck. 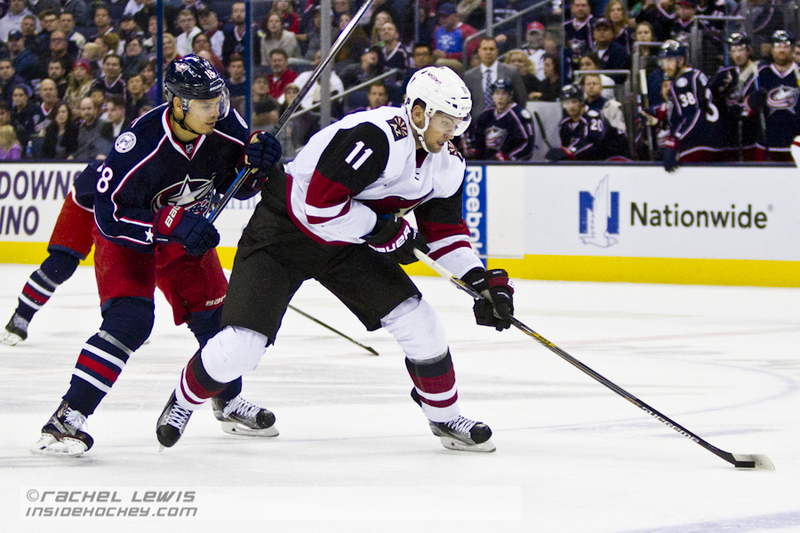 Matt Calvert (CBJ – 11) tangles with Zbynek Michalek (ARI – 4). 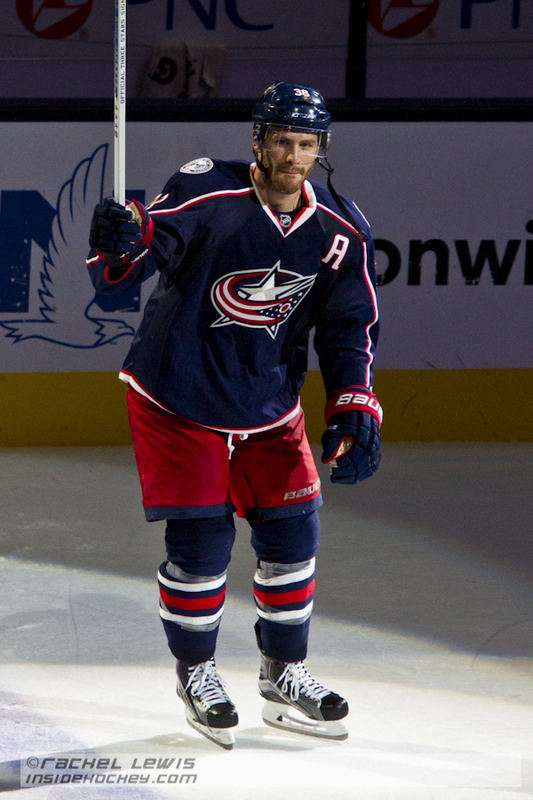 Boone Jenner (CBJ – 38) is named first star. He had one goal and two assists in the game.